Most studies of historic trends in sea levels are conducted in rural areas. Research in urban areas, which are expected to feel the greatest impact of rising oceans, is often difficult or impossible because many of the natural marshes have been lost or deeply disturbed. That’s the case in New York, too, where, by some estimates, between 80 and 90 percent of wetlands in and around the city are gone. 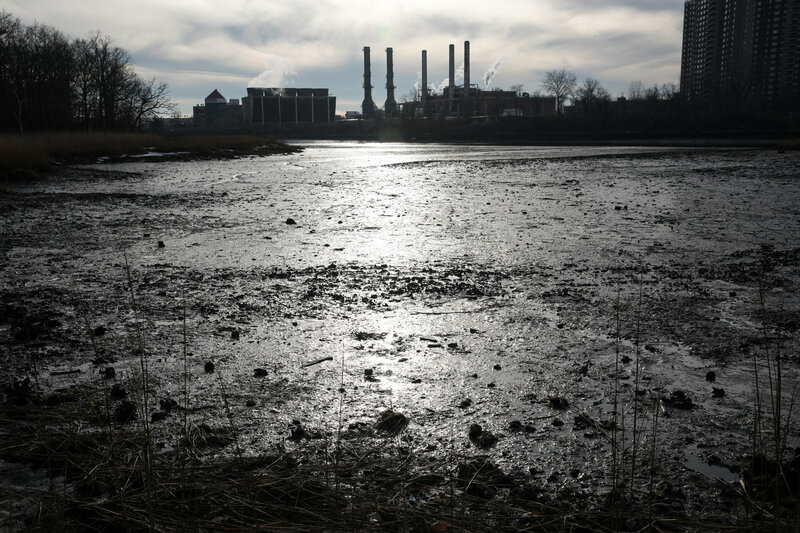 But some remnants remain, including a tract that straddles the Hutchinson River Parkway, just west of City Island, around Pelham Bay in the Bronx. On the part of the wetland area west of the highway, bordering Co-Op City — a 35-building complex with more than 50,000 residents — the degradation of the marsh is evident. 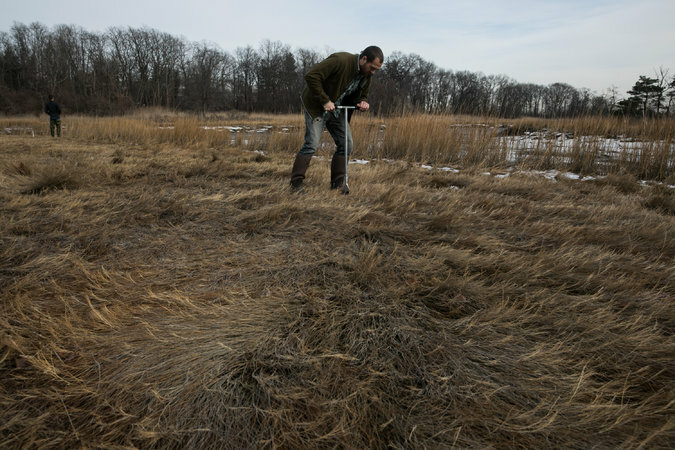 Muddy flats have replaced the fields of tall grass, known as Spartina alterniflora. But to the east, on the border of the bay, the marsh is healthier. Four years ago, a team of scientists from a diverse set of backgrounds set out for that narrow stretch of land to do something never before tried: chronicle sea levels around the city over a 1,500-year stretch. 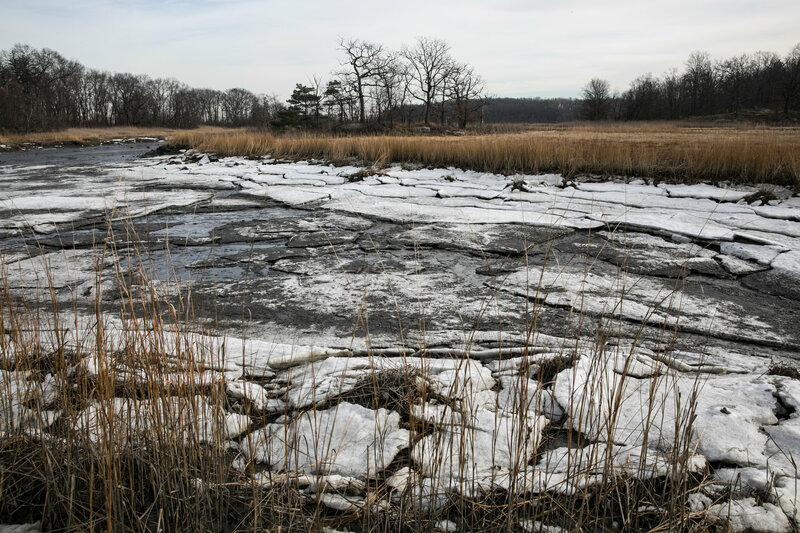 “We were chasing one of the last little bits of marshes left,” said Troy Hill, a biologist with the federal Environmental Protection Agency who was a graduate student at Yale when the research began. The lead author of the study, called “Relative Sea-Level Trends in New York City During the Past 1,500 Years,” is Andrew Kemp, a scientist at the Department of Ocean and Earth Sciences at Tufts University. Mr. Kemp’s previous work, looking at the impact of sea-level increases and hurricane flooding, drew a lot of attention after Hurricane Sandy. But the lack of historical sea-level data for the city was a missing element in any attempt to understand the effects of climate change. 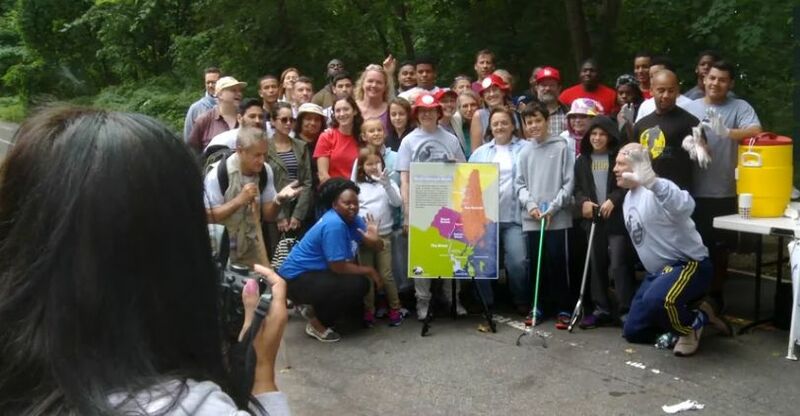 The team worked in close coordination with Ellen K. Hartig, a scientist at the New York City Department of Parks and Recreation who specializes in wetlands. In 2012, the researchers began taking core samples from the area, placing segments extracted from the earth into rigid plastic sleeves, labeling them and wrapping them in plastic so they could be refrigerated until they were analyzed in the lab. Digging was the easy part. The work in the lab was painstaking and would take more than four years. Every inch of the dirt held clues to what had been occurring in the wider world at the time it was deposited in the marsh. For instance, a small peak in the concentration of lead was found to correspond with its increased production and use during World War I, while a decline corresponded with the Great Depression. The soil told of local pollution, indicating the use of municipal refuse incinerators, which peaked in 1937, and offering clues of events farther afield, such as evidence of the above ground nuclear weapons tests conducted in the 1950s and 1960s. Most important, the sediment marked tidal flows. Every day, for thousands of years, the tides would come in and deposit sediment before rolling back out. Mr. Hill likened these layers upon layers of sediment to the growth rings of a tree. Less than 10 feet of dirt held 1,500 years of history. Because of where the city is positioned geographically, the sea-level rise in the region may be up to 32 percent greater than the global average by the end of this century, scientists have said. Philip Orton, a physicist at Stevens Institute of Technology in Hoboken who also contributed to the study, sought to put climate change’s potential for destruction in perspective. Since 1821, through nearly 200 years, the seas have risen roughly 1.5 feet, he said. But they are expected to rise by the same amount over the next 40. While New York officials have in the past announced ambitious plans to protect the city, many of the most expansive ideas remain on the drawing board. “The efforts by New York City to adapt the city to flood risk, post-Sandy, have been intense, but are not protecting most of the city,” Mr. Orton said. He cited two examples: a project known as the Big U, which was initially envisioned as providing protection for all of Lower Manhattan but is currently more focused on the Lower East Side, and another aimed at protecting Hunts Point in the Bronx. Hunts Point, the food distribution center for the entire region, is a vital part of the city infrastructure. But as things stand, the city does not have the funding to build the protections, he said. An earlier version of this article misstated, using information from a researcher, the time it is expected to take for the sea level in the New York area to rise another 1.5 feet, after rising that amount in the last 200 years. It is 40 years, not 85. This entry was posted in General Posting and tagged Dept. of Marine and Coastal Sciences of Rutgers, Dept. of Ocean and Earth Sciences / Tufts University, Eastchester Bay, Environmental Protection Agency, Hutchinson River, NYC Dept. 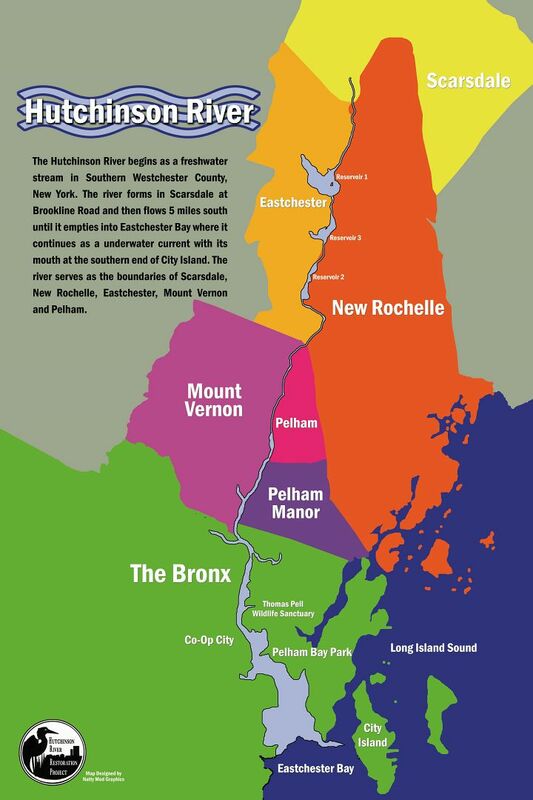 of Parks and Recreation, Pelham Bay Park, Stevens Institute of Technology, Thomas Pell Wildlife Sanctuary. Bookmark the permalink.